This page focuses on some of the upgrades and custom things I’ve done to the car since the rebuild. 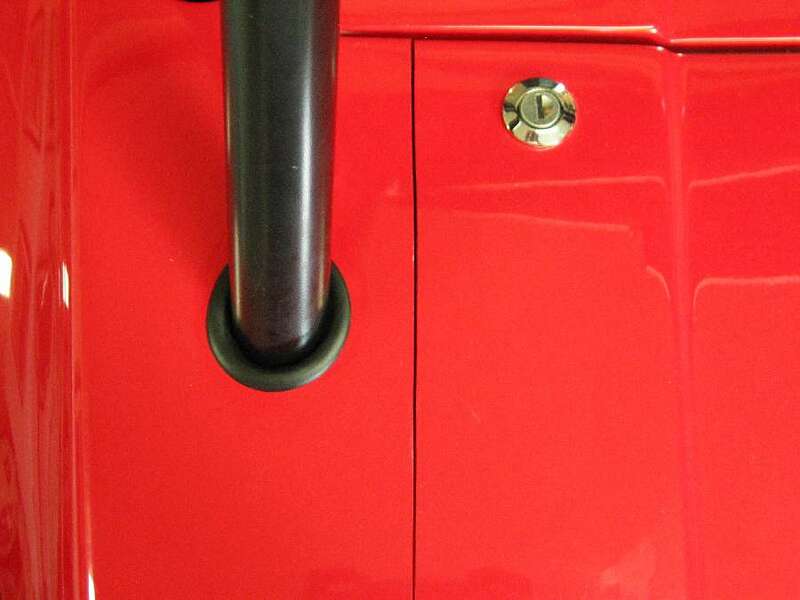 Locking Boot Lid – The factory locking boot is a great feature, but unfortunately the lid doesn’t work with a proper roll bar fitted with rear stays. 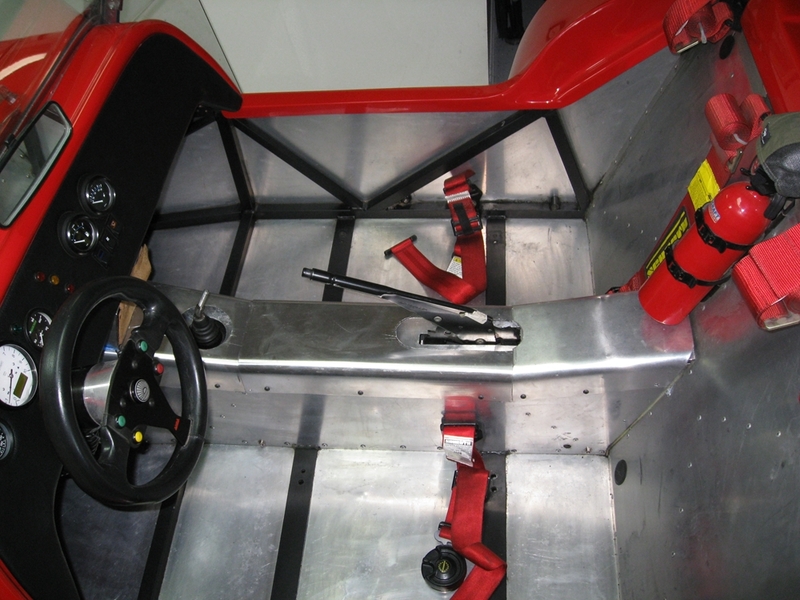 Since I wanted the safety of a real roll bar, and the theft deterrence of a locking boot, I decided to pull out the tools and turn the one piece lid into a three piece affair that would work. 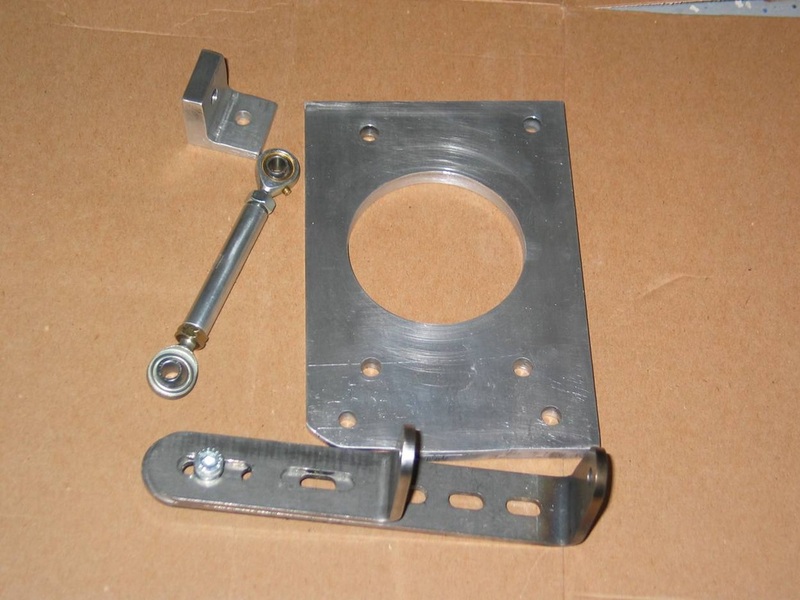 The boot cover is cut into three sections: two fixed end plates and a hinged lid in the center. The end plates are fixed to the body with silicone and shimmed by the thickness of the hinges to ensure a level surface across the three pieces. 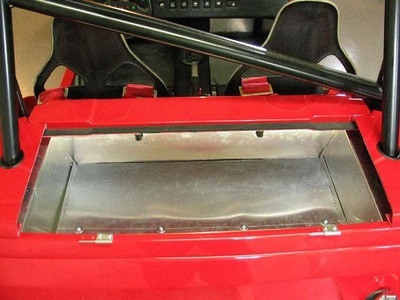 The photos to the right show the rear stays passing through the fixed end plates of the boot cover. My original plan was to cut a hole that was just a tiny bit bigger than the stays themselves, and then seal the gap with silicone. However, after living with it like this while I waited to fabricate the boot box, I decided it would look a lot better if I enlarged the holes and then covered the edges with the same rubber edging material I used to line the air filter cutout in the bonnet. This gives it a very finished appearance and means that no one can tell that my holes were...um...not quite perfect. table saw so they matched the angle I was trying to achieve in the aluminum. 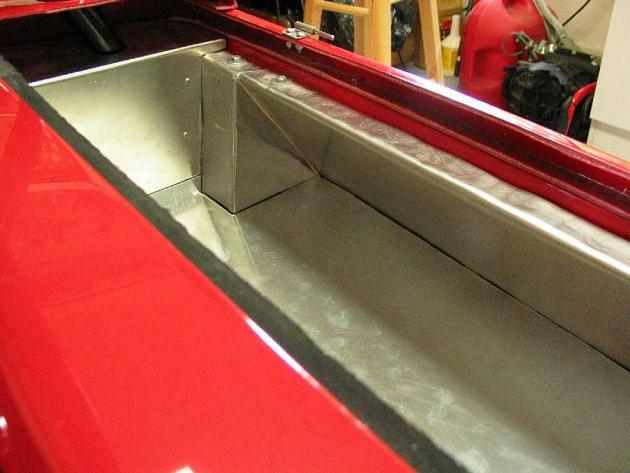 The finished panels were then lowered into place, bolted to the lip in the body tub just like the stock boot box, and finally riveted together. 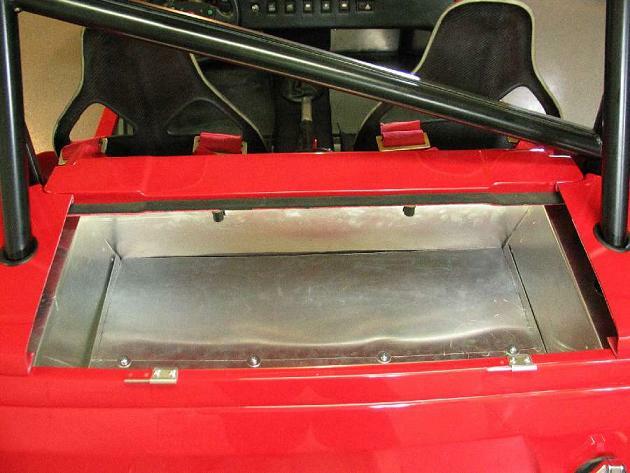 The tops of each side panel extend outward under the end plates to provide protection from road debris thrown up by the rear tires. 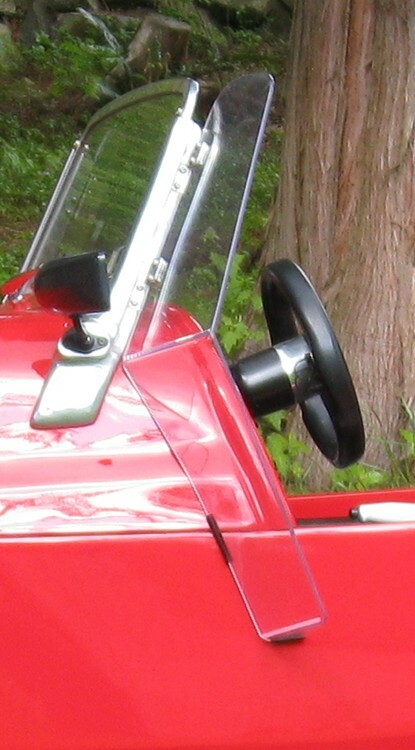 BTW when I cut and bent the rear panel, I ended up having a small triangular void on the top lip immediately over the bend for the fuel filler neck bump out (you can just make it out between the two bolts located at the top of the photo below the hinge). I cut a piece of aluminum to fit and then attached it with silicone. build was actually pretty simple. 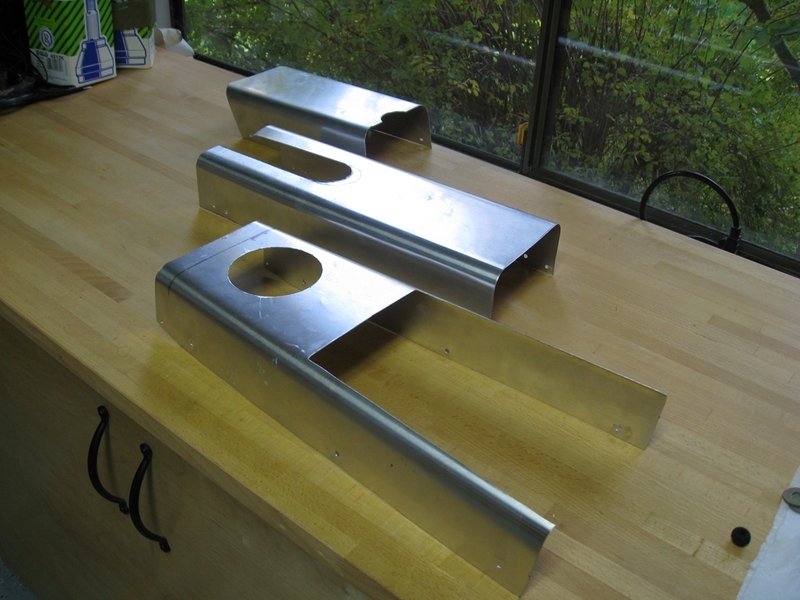 I made bucks out of scrap wood edged with ¾” radius ¼ round molding, bent the sheet aluminum to shape, then attached it to the existing transmission tunnel via cap head screws and nutcerts. The new caps are first covered with closed cell foam to add a little padding and minor heat insullation and then topped with the vinyl which is attached with Velcro. 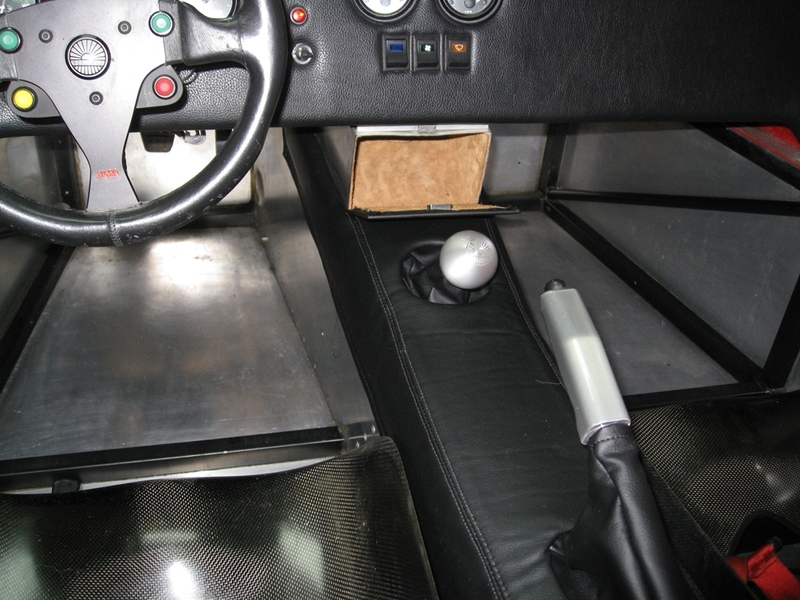 I also made matching gaiters for the handbrake and gear lever, and added a hidden glovebox that when closed looks as if it is simply a cosmetic connection between the tunnel and dash. The end result looks better in the flesh than in the photos. The wrinkles are not as apparent to the naked eye, and the stitching used for the French seams is black not white, so is a bit more subtle. Overall, I am really pleased with how this came out. required. Because I don’t weld, I came up with a design that bolts together from aluminum stock. I drilled a huge hole in the plate to lighten it up, and fabricated the L-bracket out of a solid block with a hacksaw and Dremel. 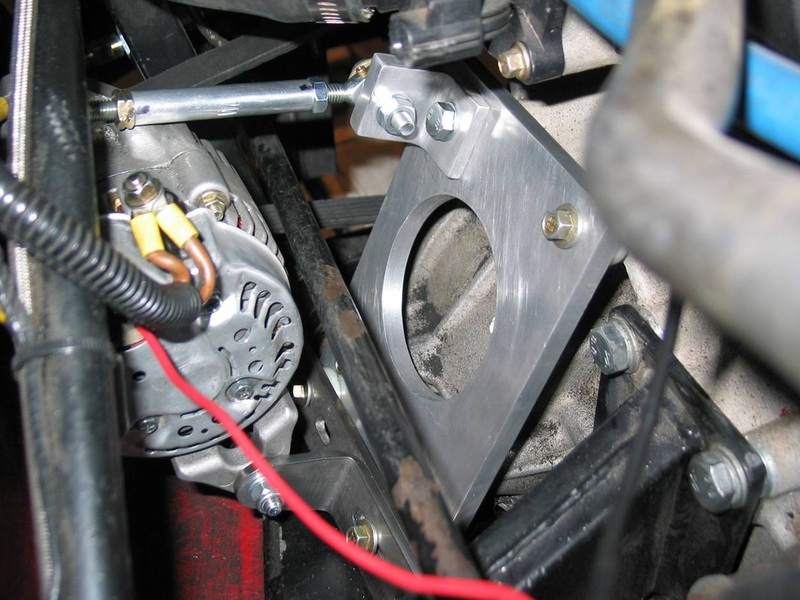 I then used a tie-rod from a kart to adjust belt tension. 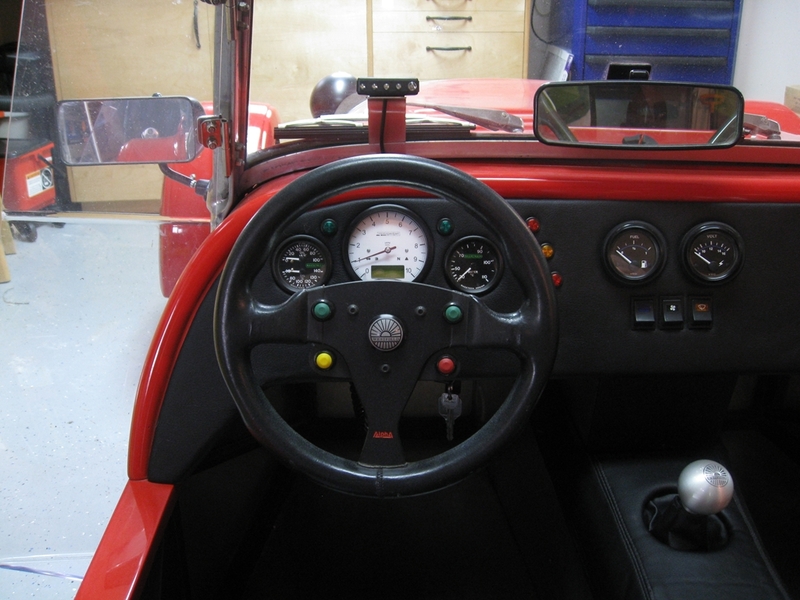 Steering Wheel Mounted Buttons – I’m a Formula 1 fan and a little trendy, so I decided my car should have steering wheel mounted buttons to control key functions. I used Apem's momentary pushbuttons in green to control the turn signal module (Cadent Technologies Smart Flash) in yellow to handle the display menu for the Motogadget tach/speedometer, and a latching version in red, operating via a relay, to control the high beams. 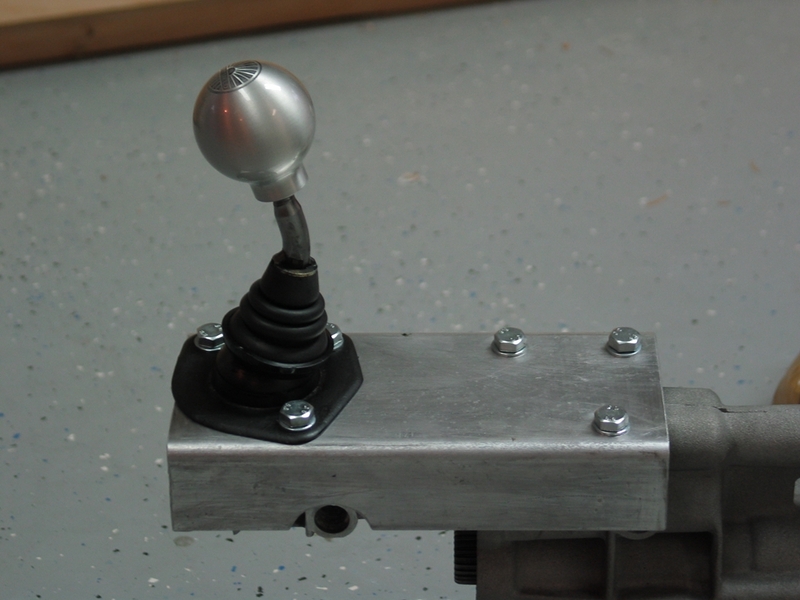 The switches attach via a quick connector located in the steering wheel hub to a spiral coiled wire that turns with the wheel. 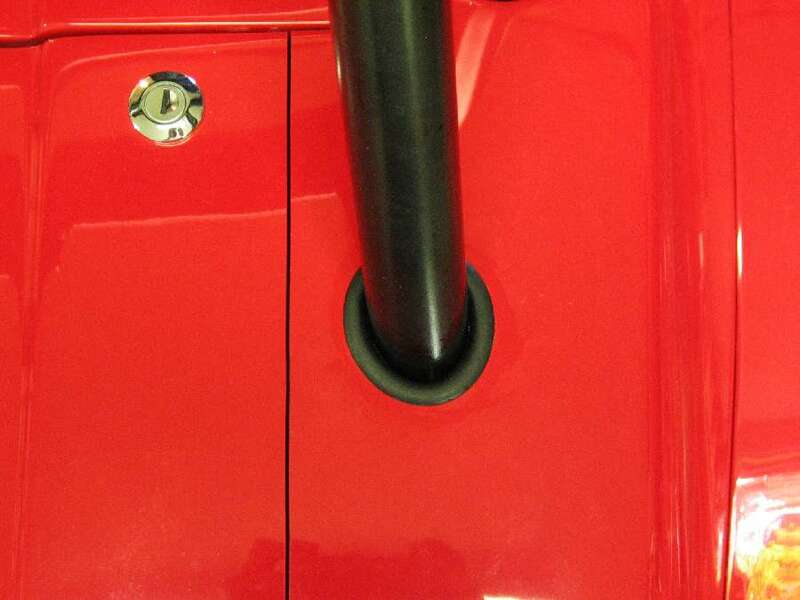 For the horn, I used another, much larger, aluminum Apem momentary pushbutton and had someone laser engrave the Westfield logo on it. It isn't keyed, so the button and logo, can rotate, but like the other buttons, it works great and the shallow side of me loves how everything looks. 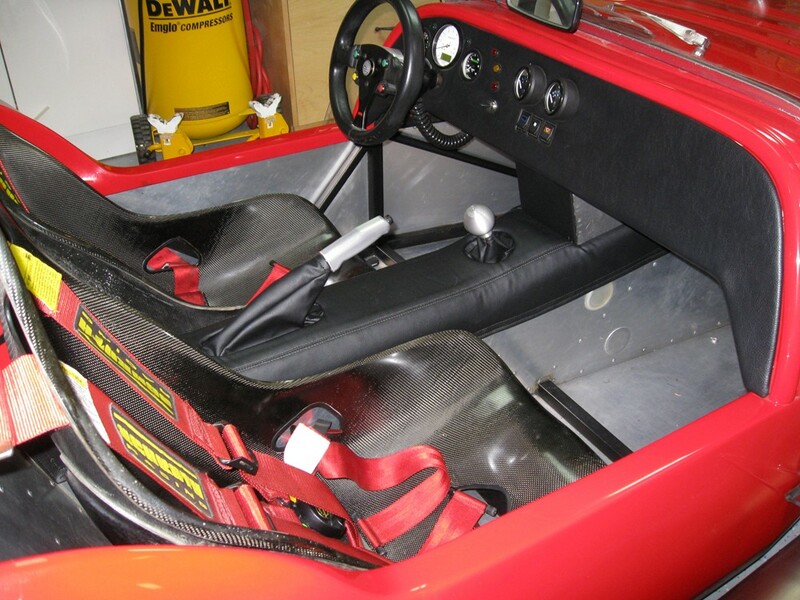 BGH Gearbox and Short Shift Kit – The stock Type-9 gearbox has a ridiculously short 1st gear. Even after switching from a 3.92 open diff to a taller 3.62 viscous LSD, I still couldn’t use more than half throttle in 1st and have any hope of doing anything other than creating a smoke screen. 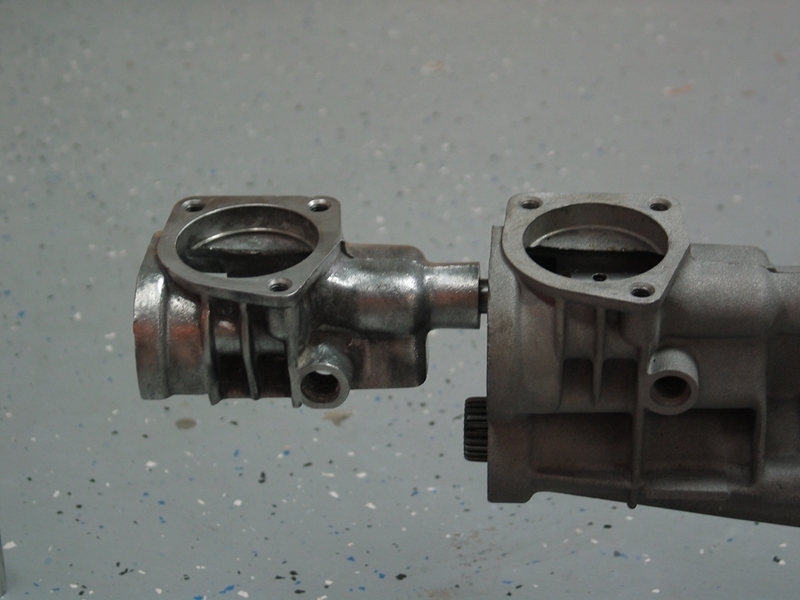 Given the Duratec was putting additional strain on the stock gearbox, I decided to replace it with a BGH long 1st gear HD unit. 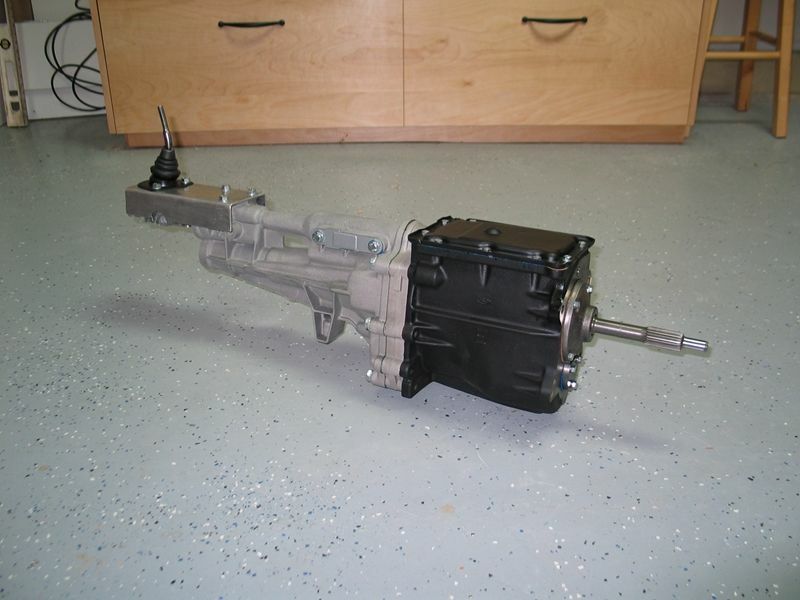 1st gear is over 22% taller than stock and is now good for 47mph @ 7500rpm. I still can’t use full throttle in 1st without wheel spin, but at least I can now come close. 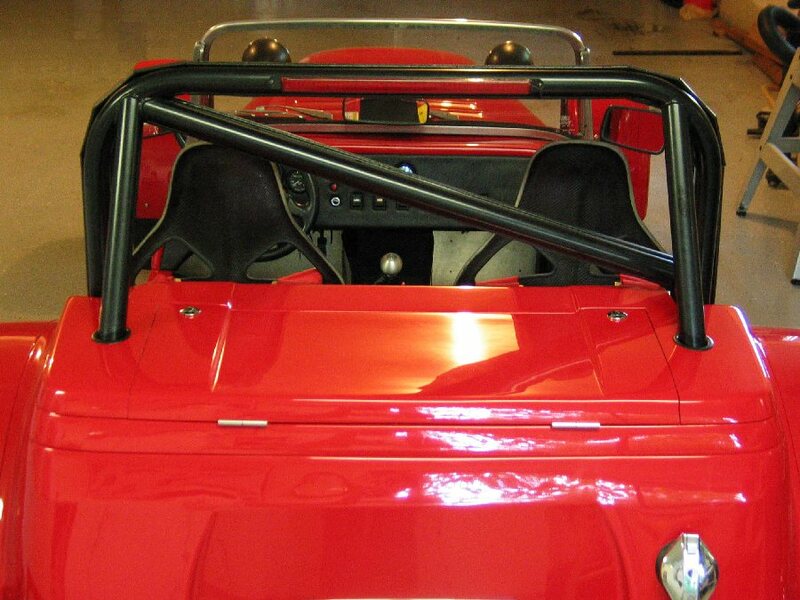 Wind Wings – With the sidescreens fitted, the Westfield is a relatively calm environment, but they have some negatives. First, they insulate you from the surroundings which is a bit contrary to the se7en experience, and second, the reduced air flow means heat buildup in the cockpit becomes a problem on warm days at anything less than freeway speeds. Running sans sidescreens solves the heat buildup and sensory isolation issues, but the buffeting at freeway speeds quickly becomes very uncomfortable. 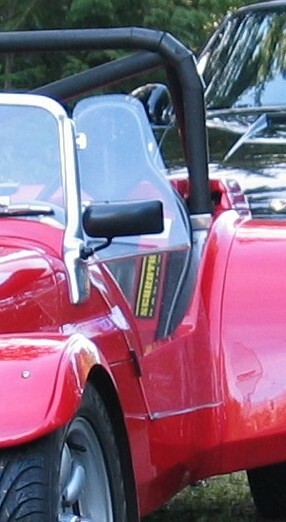 the windscreen pillars. They may look a little odd, but they work great, and even do a pretty god job in the wet. One of the best mods I’ve done to the car.